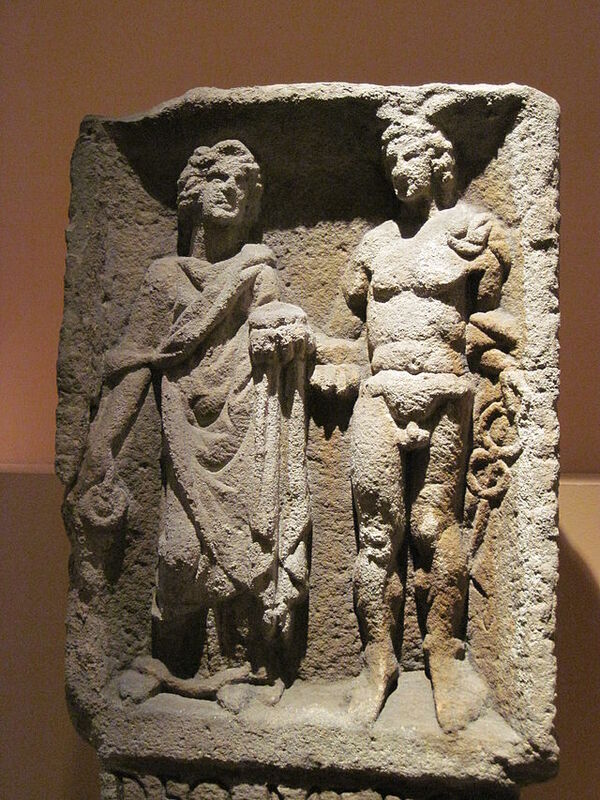 Rosmerta’s cult was strongly associated with the Roman god Mercury – they often appear together in art and inscriptions, and they sometimes share attributes – including the caduceus that was Mercury’s special attribute. Relief of Mercury, photo by Michal Maňas. Wikimedia. We know from Julius Caesar and Tacitus that “Mercury” was the foremost god of the Celts, and that he was important in the Germanic territories. Rudolf Simek’s Dictionary of Northern Mythology has 12 entries, over three pages, for various Mercuries found in Germanic territory or areas with both Celts and Germans. Enright argues that the Germanic Mercury eventually evolved into Odin. This suggests Rosmerta evolved into Frigg, since Rosmerta and Mercury appeared together so often, and are usually described as each other’s consorts. This change did not take place in a vacuum – Enright argues that during this time in the Germanic territories the old system of tribal warfare was being changed to small, mobile warbands loyal to a single, charismatic leader. (Think of the vikings.) Enright argues the combination of war-god and prophetic goddess was a product of the times. Rosmerta’s cult, according to Enright, changed alongside her consort’s. Part of Enright’s argument is that in addition to the cult of the German Mercury, exceptional warriors such as the rebel general Civilis were inspirations for the new cult of Odin. Rosmerta’s cult shifted along with Mercury’s, from a tribal one to one fitted to the new warbands and warrior-kings. Also, the Germans seem to have viewed prophecy as a mainly feminine attribute, while the Celts (at least the Welsh and Irish ones) don’t seem to have shared that view. Perhaps as Rosmerta’s cult was absorbed into the Germanic context, it was shaped by their ideas about women and their abilities. After all, the Rhineland was an area where Romans, Celts and Germans mingled – it would not be surprising for new ideas about deities and religion to have arisen there. Her name, too, harks back to the mother-goddesses, if we read it as “Great Provider”. The Celtic scholar Vendreys, however, read it as “Great Prophetess”, which links her to Veleda and others. Furthermore, the interpretatio romana for Rosmerta was often Fortuna, the goddess of fortune – what could be more appropriate for a goddess who knew the future? On the other hand, Odin shares mead with Saga, who knows the past and discusses it with him, and he steals the mead of poetry from the giantess Gunnlod, who was guarding it. (Kvilhaug has a lot to say about Gunnlod – links below.) Saga cannot be said to be prophetic in any way, and if the story of Gunnlod shows us anything, it’s Odin’s habit of cutting out the middleman, perhaps a throwback to his days as the Mercury worshipped by traders. Enright says he sees Rosmerta as a goddess of “fertility, fate, or both” (240), and to my mind this brings her close to Frigg, who “knows fate” (Lokasenna) and in two different stories is connected to birth. Frigg’s role as queen of heaven comes in here as well. We have seven inscriptions to Mercury Rex, and one to either Rosmerta and Rigana, or else Rosmerta the Queen. This and her mead-serving role have suggested the goddess of sovereignty from Celtic mythology, who shared her mead and her person with the rightful king. Rosmerta the Queen would have stood along her consort as the ruling goddess of the warband, and later the kingdom. * I was thinking, on reading this over, that it is Frigg who tries to make peace between Loki and Odin in Lokasenna, the Eddic poem in which Loki insults all the deities. Her attempt fails, but of course Loki wants it to fail. Still, it is interesting that they fall out over the question of “fate”, which apparently both Frigg and Gefjun can see, and Odin claims to know it as well. Loki’s fate is the unspoken issue behind the whole poem, and it ends with him meeting it. Green, Miranda 1997: Dictonary of Celtic Myth and Legend, Thames and Hudson. McKinnell, John, 1986-9: “Motivation in Lokasenna”, Saga-Book of the Viking Society XXII: 234-62.